There’s just nothing quite like Thanksgiving weekend: a morning prepping turkey and learning Grandma’s famous roll recipe, parades and football on the TV, dinner that tastes of nostalgia, long afternoon naps and . . . mad dashes to the mall. In between eating and shopping, we’re sharing moments with family as we gather for what may be the first time in months. And better yet, we know Thanksgiving is just the start of the exciting season to come complete with gift-giving and more food! It’s no wonder we shell out the big bucks for our time together, right? Unless you wake up from your turkey-induced coma with loads of regret from all the sales you indulged in at the mall. This year try something a little different: Enjoy spending more time with one another while spending less money. We’ll help you! 1. Prioritize your holiday plans. Think beyond Thanksgiving for a moment. Write out all the things you’d like to do between now and the new year. Include travel, gifts, dinners and parties. Take some time to rank your holiday wish list and be sure your budget reflects your decisions. For instance, you may stay home for Thanksgiving so Santa has the cash to do his thing. Or maybe you’ll choose to trim your Christmas gift budget and spend that money on a Thanksgiving trip to see family or friends. 2. Make a budget and check it twice. Don’t you know that Santa works year-round? So should your budget. Now that your holiday priorities are in order you can budget appropriately for the coming season. Before you head out the door to grab a few groceries or to snag some good deals, sneak a quick look at your EveryDollar budget. Confirm that what you’re buying fits the budget so you can shop with confidence. Decorations.Encourage your kids to trace their hands to make paper turkeys for a fun garland. Go outside and gather pinecones from the backyard for a pretty centerpiece. Or stretch a roll of butcher paper across the table with prompts like “I’m thankful for . . .” Place a bunch of markers or crayons on the table for your guests to grab. Dinner.Swap expensive cast iron pots and fancy china for disposable plates and pans (bonus: easy cleanup!). Focus on a few key dishes like the turkey or a ham, two of your favorite sides and one dessert, but leave the rest of your ideas for another time. According to the Farm Bureau, by sticking to the basics you can feed 10 people a complete Thanksgiving dinner for around $50.¹ For more ideas on how to save money on food, check out EveryDollar's Grocery Savings Guide. 4. Accept invitations from others. Did you get an invitation to join family or friends at someone else’s place for Thanksgiving? Take them up on the offer! While it’s fun to host (and you should certainly open your home if you want to), it’s just as fun to be a guest. Show your gratitude by offering to bring a dish and helping with cleanup after dinner. You’ll save money and make a friend for life! 5. Volunteer your time. 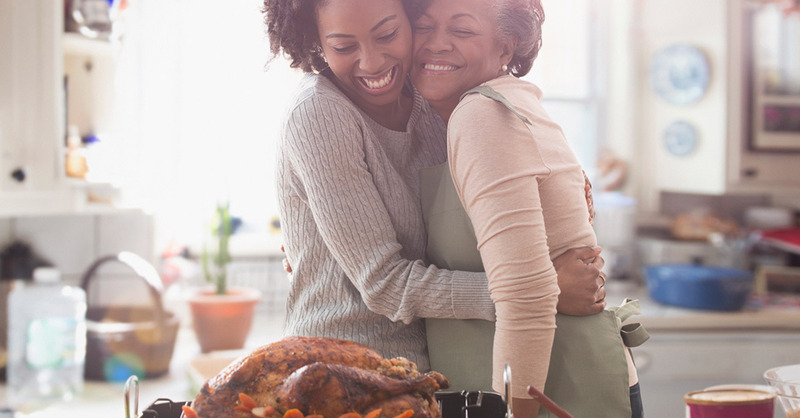 Call us crazy, but there’s really no better way to build your savings over the Thanksgiving weekend than to skip your own dinner and provide one for someone else in need. Contact a local soup kitchen or homeless shelter and ask how you can be of service. You might just find that this is your new favorite tradition. Plus, you can invite your friends and family along! 6. Be a smart shopper. Surveys suggest the average person will drop $743 between Black Friday and Cyber Monday.² Talk about an expensive weekend! We’re okay with this number as long as you’re getting good deals, buying stuff you already planned to buy, and keeping all of your spending in line with your budget. Stay on track by researching sales and making a specific shopping list before heading to the store or sitting down at your computer. 7. Give yourself margin. We all enjoy the holidays more when they’re not crammed with activities and stress! Less really does give us more. As you approach the start of this busy season look for opportunities to slow down. Build space into your day and into your budget. Allow yourself a little breathing room so you have the chance to take in and appreciate the joy that’s happening around you. Need a little extra help? Use EveryDollar to get moving on your money-related holiday plans! With an easy system for creating a Christmas budget and tracking your spending, EveryDollar gives you one less thing to stress about—and more time to spend with the people in your life!